The Multi-function Portable Solar Power System provides a freedom of supplying electricity wherever you need it and power your life with environment-friendly Solar Power Green Energy. The System is portable and easy to carry, convenient to install, use and maintain. It has multi-adaptor USB cables for different types of sockets. 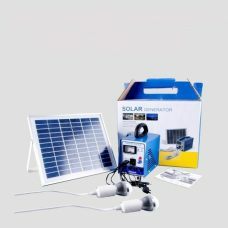 The Portable Solar Power System could supply with Green Energy Smartphones and Mobile Phones, Radio, small appliances like fan etc., provides reliable source of light. Ideal for: support with electricity remote areas like house in mountains, households, camping, fishing boat or yacht. Also suitable for some emergency cases when electricity is not available. For whom: people whoenjoy living in harmony with the nature or have to spend some time far from civilization, but still want to use electric gadgets; for desperate travelers, campers, explorers, and everybody who prefers active life style. 1. During charging process, the Solar Panel should be placed at an angle of 30°~45° for the best results. 2. It is better to charge Power Bank first and then use it to charge mobile phone or other devices. 3. Do not charge mobile phone or other devices straight from under the light. 4. Do not charge mobile phone or other devices in case of insufficient sunlight. - In case when the product is not being used for a long time, charge it for at least 10-15 hours by the sun before use.